Many of my clients ask if it is worth to spend money acquiring sculptures whose main medium is neon (or LED, or fluorescent bulbs) that require electrical power to be turned on. Since I have featured artists and exhibits that explore the use of light in contemporary art, I thought it would be a good time to put together a brief guideline about my thoughts on the subject. The answer to the question is generally yes but only if the collector can live with the piece. In other words, sculptures made of neon, LED or any other bulb that require an electrical outlet are more often than not statement pieces –someone who is just starting an art collection or someone who is unsure about his/her own preferences, should steer clear. Also, all these sculptures are very delicate and quite fragile; proper care is required and people should refrain from touching them as much as possible (I don’t doubt that people can be extremely careful but lots of pets, lots of kids or maybe even lots of parties can be detrimental to light-based sculptures). Assume Vivid Astro Focus's neon sculpture in multicolored bulbs. The wide variety of price ranges in the “art light” sculpture market will also make or break the deal: depending on the artist, the complexity of the piece, the production costs and the number of pieces released within a series (normally called editions) the prices can go from a few hundred to six figures. Then the second question I pose to my clients is: can you live with this piece for a long, long time or is it a hype-of-the-moment? The answer to this question will determine what to pay for a light sculpture. Some LED columns, like the one below which I placed in my client’s living room (this one is by German artist Hans Kotter) require a stable surface to stand on and also being anchored to the wall (from the top). The most amazing feature of this sculpture is that it changes colors, speed and frequency of color combinations (all controlled by a tiny remote control). The piece is quite mesmerizing to the eye, requires setback to be appreciated and it also should be away from traffic. The corner by the window proved to be the best place to install it. If the light sculpture is formed of a phrase that is free floating, the artist will provide the gallery with a paper template that will be attached to the wall to be used as guidance. If this is the case, there are several complexities that only real professionals in the installation of these sculptures are equipped to take care of. I don’t advice anyone to attempt a "DIY" installation with these pieces. Weather the wires should be exposed or not is a matter of taste. In some cases, the wires give the piece a more irreverent quality and in some cases the artist has intended for them to be exposed. In other situations, a more polished (and quasi-permanent) display will call for hiding all the wires inside the wall. Neon, LED lights and fluorescent bulbs used by respected artists who know how to work with electricity are usually guaranteed to last for 150 years –if properly cared for-. Reputable galleries also stand by what they sell: if the electricity as we know it changes or if something happens that doesn't allow the sculpture to function as the artist intended, then the gallery together with the artist will do the necessary adjustments to make it work the way it is supposed to. Deborah Kass's neon "After Louise Bourgeois"
If a light sculpture breaks, even a little bit, there is a very high chance that the rest of the sculpture won’t lit up. The good news is that these minor accidents can be repaired. Galleries and artist usually know where to send the piece for repair and they should always be asked first. 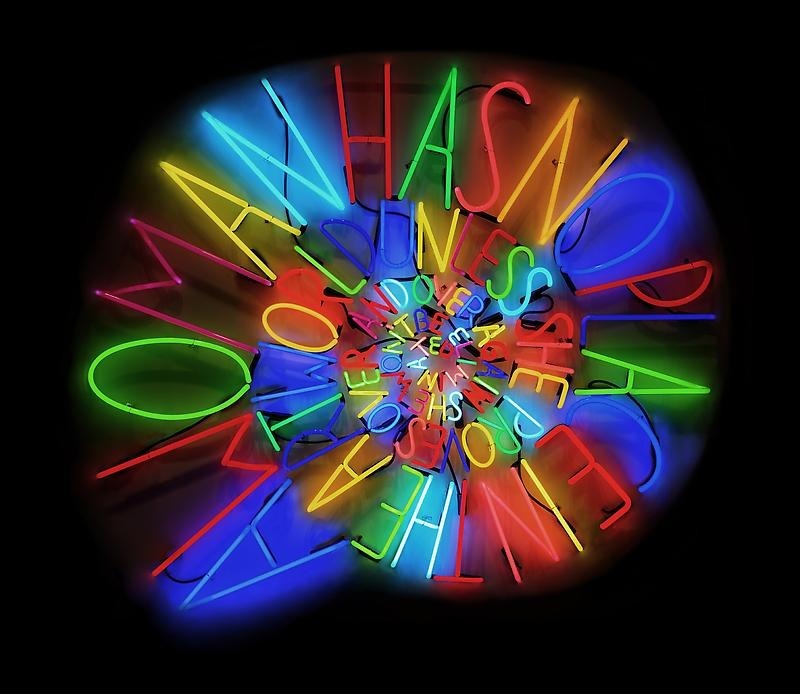 In New York City I can recommend Let There Be Neon, which I have personally used for me and my clients and think they have done a great job (they also install any kind of light sculpture). Alejandro Diaz's "Happiness Is Expensive"
I hope to have shed some light and encouraged those who were on the fence (or perhaps discouraged some who are not ready yet).